Thank you for the documentation, and the details of your catalog purchase in 1975. This is very good information! It is interesting that the early 1976 flyer mentions that great care was taken in duplicating the color and paper. I would regard that as a very true description. The one mistake they made was with the positioning of the bottom TSMG's trigger in relation to the target line. One of the 3 reprints I have has a date of 1977 written in it, and from the information you have provided, it appears Numrich reprinted the catalog in early 1976, and that there was a decent market for the catalogs for $1.95 at the time. I would be very interested in obtaining high quality scans of the 2 advertisements you have posted. If you are willing to supply these, please contact me at my e-mail address listed below. 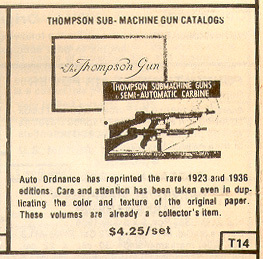 I just looked at my 1990 Numrich catalog (Edition 16), and the 1923 and 1936 Auto-Ordnance catalog reprints were available then as a set for $4.25. The advertisement is much the same as the one you pictured. To follow up on an earlier post, here is a picture of the 1923 catalog with the cloth binding. It may also have staples in addition to the cloth. 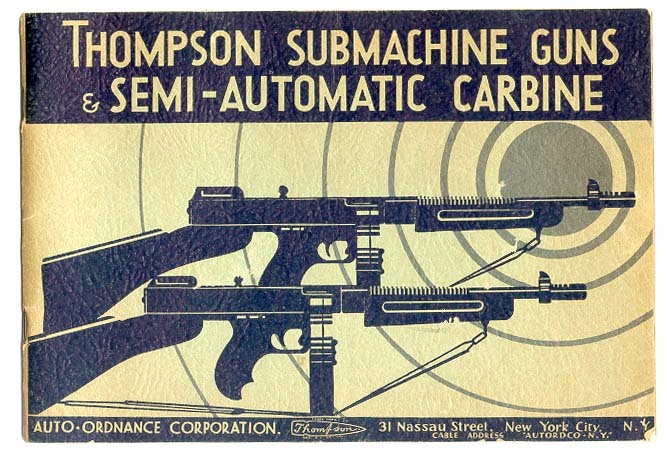 I have not examined this catalog in person, but I can say with almost 100% certainty that the catalog was acquired between 1932 and 1935 by a person who used it to aid in developing a sales tool for another submachine gun of the 1930's era. I own most of the estate paper material that this 1923 catalog came out of. I am not certain whether all 1923 catalogs were made with the cloth binding, but I believe they are probably the first ones published. I've owned the 1922 Catalogs which did have staples, and a 1923 Auto-Ordnance AUTO-RIFLE Catalog that I sold off to a very well known Collector back in 1992. 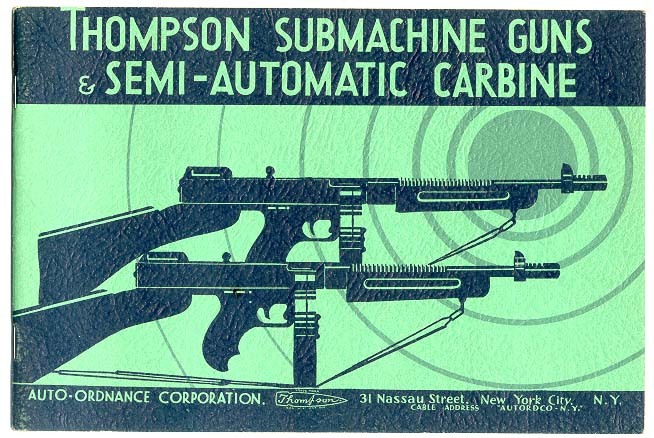 I have owned original "The Thompson Gun" Catalogs, but these ALL had a White/Green Thread Binding. No staples. 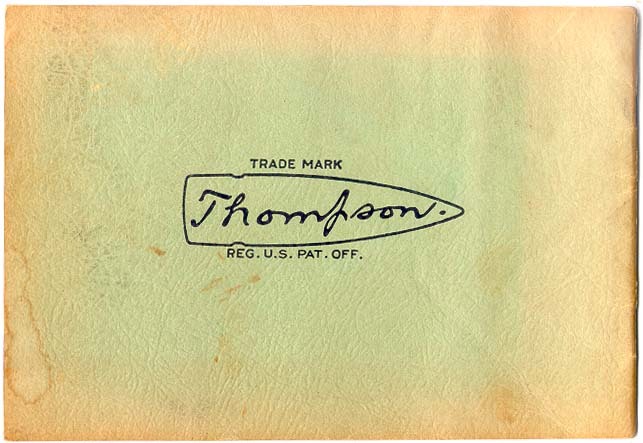 It's my belief those in which have a Stapled Binding are fake in reference to the standard AO 1923 Thompson Catalog, and not the 1923 AUTO-RIFLE Catalog. It is curious that this 1923 Catalog that David Albert shows has provenance back to 1932-35 and with a fabric or cloth edge. Early in 2003, I asked some other collectors what they may have seen, all but one had only seen staples including Tracie who said his had staples. The one member other than LIONHART who said he did have one once with the sewn (white/green thread) binding, also said the one he has now is stapled. He knows who he is and if he cares to chime in that would be great. Another member here has a 1923 Catalog acquired from the Michigan State Prison, and it has staples along with what seems a reasonable provenance to the era. Judging that there are at least a couple with staples and another with a fabric edge with a seemingly reasonable provenance history that I am aware of, makes me think not just one original binding may be possible. I can't prove it but I feel that there may in fact be 3 possible "original" bindings, sewn with white/green thread, fabric/cloth edge with staples, and staples alone. Maybe PhilOhio's suggestion to refer to them as a 1st, 2nd or 3rd printing would be more appropriate, I don't think "editions" would be right as the contents are the same. Lionhart and I have exchange emails on this several times as he was the one who 1st pointed out to me the sewn binding, which I thank him for. I wish I could see one but based on his and one other members comments I would say the sewn binding is probably the 1st printing for sure. Now the reproductions out there for this 1923 Catalog are GREAT so a stapled version with embossed lettering on the cover at this point still could be a reproduction, unless there is some provenance. I am hoping to try and take a jewelers loop to see if there are any visible differences beyond what the naked eye would notice but I am not holding my breath on this to prove anything. OK I put on my nomex suit for any flames! PhilOhio's post is right on. Thank you to PhilOhio for his most recent post, and for the Numrich story. 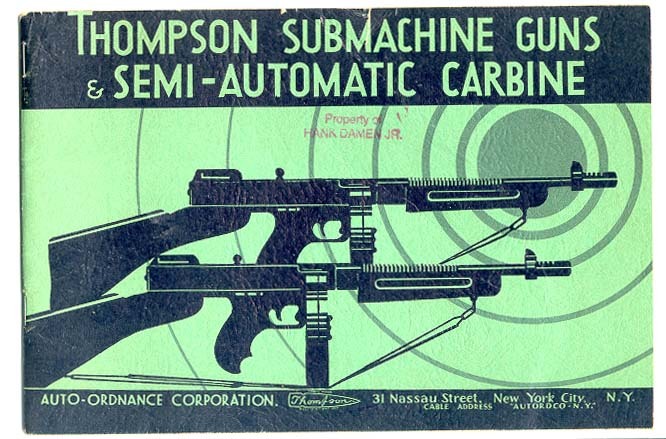 I think it is important to note that probably none of us can say with 100% certainty just when or how "original" catalogs were printed for Auto-Ordnance. More than likely, anyone who might truly know this information is probably deceased, and explanatory documentation may not exist for us to study. There were probably different printings made that could all be considered "original." For the most part, things like this are a mystery we have to put together, and that's what makes it fun. Even with the doubt stated in my preceding paragraph, I will say that the catalog in my picture almost certainly was acquired between 1932 and 1935, making it very doubtful that it is not an "original." 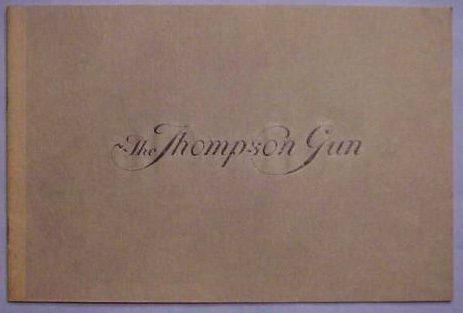 It was part of an estate that includes original signatures of Marcellus H. Thompson on correspondence regarding Auto-Ordnance, and also many signatures of another fairly well known player in 1930's submachine gun development. 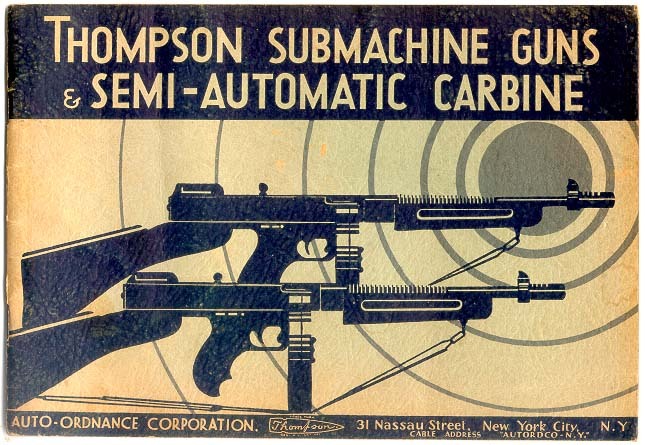 The catalog in the picture was part of a group of 1930's submachine gun paper marketing examples, along with catalogs and manuals from other weapons of the era, that aided in the development of a marketing tool for a submachine gun that was developed in the 1930's. I have a substantial quantity of original documentation in my possession to back this up, and what I will say at this point is that sometime in the near future, this evidence will be published for everyone to see. The material I have in my possession had not (to my knowledge) been previously written about or examined by anyone in our community until I made it available, and, more than likely, sat in a file drawer and/or box for almost 70 years. I would be interested in seeing pictures of any examples of the 1923 Auto-Ordnance catalog that readers of this post may have in their possession, especially any that contain a fabric binding of any sort, whether it be fabric alone, a combination of fabric and staples as with the catalog shown in my example, or catalogs bound by staples. I am interested in detailed close-ups of the cover, and also of the page showing special mounts, and the page showing 28 TSMG's mounted in the airplane mounting. This has been a very interesting thread. 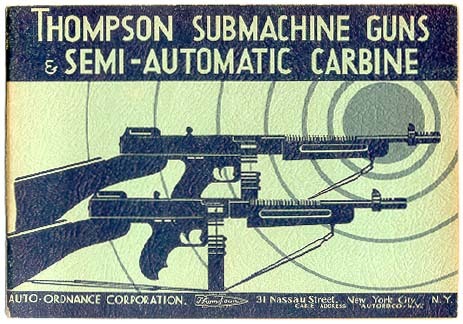 I too purchased the 1936 and 1923 Catalogs from Numrich Arms Corporation (NAC) via mail order many years ago. I can't recall the exact time but I know it was prior to December 1975 because that is when I graduated from college. If my memory serves me correctly, I am fairly sure it was in the late 1960's that I acquired my catalogs. 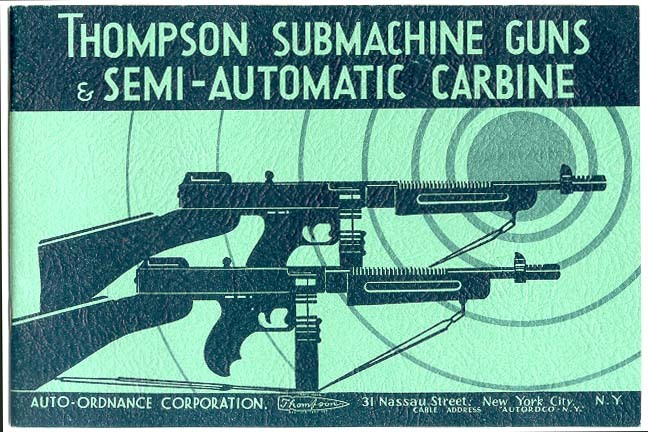 My 1936 catalog is just like the pictures of the reproduction that have been posted in that the trigger of the lower Thompson does not intersect the ring of the target. It has the Nassau Street address. My 1936 catalog has not been stored as carefully as Phil's but it has been well taken care of and would be listed as mint condition. I have always thought it a reproduction given the low price I paid for both catalogs. 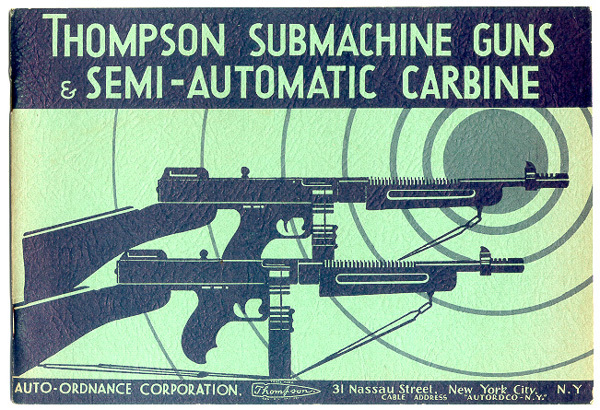 It would seem that NAC must have had some reproduction catalogs made up in the 1960's if my memory is correct. One interesting thing about my catalog is it has not started fading. I wonder if the reproduction 1936 catalogs do not fade. This could be a determinative factor in judging the originality of a 1936 catalog. I also have a tan version of the 1936 catalog I acquired 10 to 15 years ago at the Astrohall gun show in Houston. Based on the small amount I paid, I have always thought this was a reproduction but based on this thread I am beginning to have my doubts. The description of mine would be as SIG described earlier in this thread. It also has the Nassau Street address. I have not seen many tan 1936 catalogs over the years. The two-tone green catalogs are by far the most common. My 1923 catalog is the one I have often thought may be an original. It is bound by staples that are beginning to show rust. I would like to compare it to a known original. Any additional information on when NAC started reproducing the 1936 catalogs would be appreciated. I am betting it was in the late 1960's. The tan 1936 catalog is very interesting too. It seems very plausible Auto-Ordnance would print a cheaper version of their 1936 catalog, perhaps as a sales aide directed at a specific customer. This may explain why the tan version is not seen as often. This would be a great topic of conversation at the next TCA meeting. I know I would like to compare my catalogs against known originals. Your 1960's purchase of what is definitely a reproduction adds a new twist to the conversation. Of course, there could have been more originals that were found in stock, and sold by Numrich later. The originals definitely fade over time. The tan ones are still somewhat of a mystery, and I hope we can determine a more definite origin to them soon. In the interest of more complete documentation, here's a scan of the 1936 catalog purchased at Numrich in December 1975 (one of only six originals left in stock at that time). It's an interesting wrinkle that Numrich may have had reprints made years before, but it's certainly possible they "ran out" and later discovered more boxes of originals. When I was there the place was like Alladin's cave - tarp-covered palletloads of stuff stacked up around outside and even in the woods behind the buildings, some in bad condition where boxes had split from moisture and spilled their contents. Beside one pile for example I saw maybe 30 or 40 of what looked like (cosmolined) M-1 carbine breechbolts just lying on the ground. Amazing. Hard to imagine they even knew everything they had.